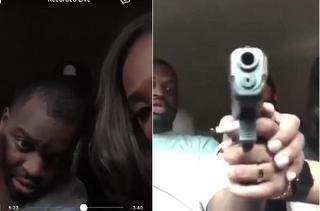 A 26-a year-old man who was shot in the head by a friend while playing with a handgun was captured on a Facebook live video. Holmes, a 26-year-old father-of-two, is now on life support after he was shot around 2.30am in the parking lot of a Valero gas station in Houston on Easter. Cassandra Damper, the woman who shot Holmes, has since been charged. The gun then goes off and Damper gasps as a bullet hits Holmes in the head, blood pouring into his white T-shirt. She and Coleman immediately flee the car, leaving Holmes bleeding out in the front passenger seat. Damper was charged with tampering or fabricating of evidence after she tried to wipe gunshot residue from her hands, according to Click2Houston. She told police that she didn’t know the gun was loaded. Coleman has not been charged. Authorities said a grand jury will decide if any additional charges should be filed.